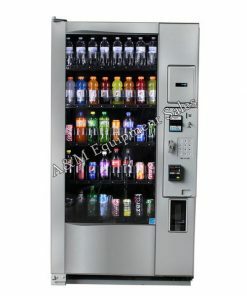 Royal Vendors is the global leader in the design and manufacture of high-quality cold-drink vending machines. The principal manufacturing plant is in Kearneysville, West Virginia, less than two hours from Washington DC. Royal vending equipment is used in more than 30 countries around the world. Royal Vendors is the supplier of choice for leading soft drink companies, vending operators and distributors. Our vending equipment features electronic controls, superior space-to-salescapability, multiple pricing of vended products,and high flexibility in vending different beverage packages. Royal Vendors has led the cold drink vending machine industry for over 30 years. Royal has a large modern factory which houses hundreds of employees who bring literally thousands of years of experience to the design, construction, testing, shipping, and maintenance of drink vending machines. A&M Equipment Sales has been re manufacturing Royal Vending machines since the nineties for Gatorade, Nestles Waters, and Nestle Quick. With doing reman we have a vast knowledge of the Royal Vendors cold-drink vending machine. We have parts in stock and can ship same day.